This is really neat looking, the layered look is so cool! Thanks! I was happy it worked out and didn’t look too busy! This looks too cool! I could swear to having seen a shirt like this once! Thanks! Yeah, it kind of looks like it could be a tacky Hawaiian shirt too! !!! So awesome! I love how each stamping element is very pronounced! Love the double stamping you did here! Its pretty. I really should try out stamping double on the nails if the results turn out so nice. Thank you!! You should definitely try double stamping – I think it looks best using two different images… at least in the times I’ve tried it! There’s a lot going on there but it all works so well! I love this! I just did my first one! I would love this for my beach house or at least maybe a bathroom themed liked a beach! Thanks! Yes – it would DEFINITELY look great in a beach house! Thanks!! Yeah, those flowers are very Hawaiian 🙂 Those tropical plates from MoYou are all so perfect for this kind of design! You should totally get it! 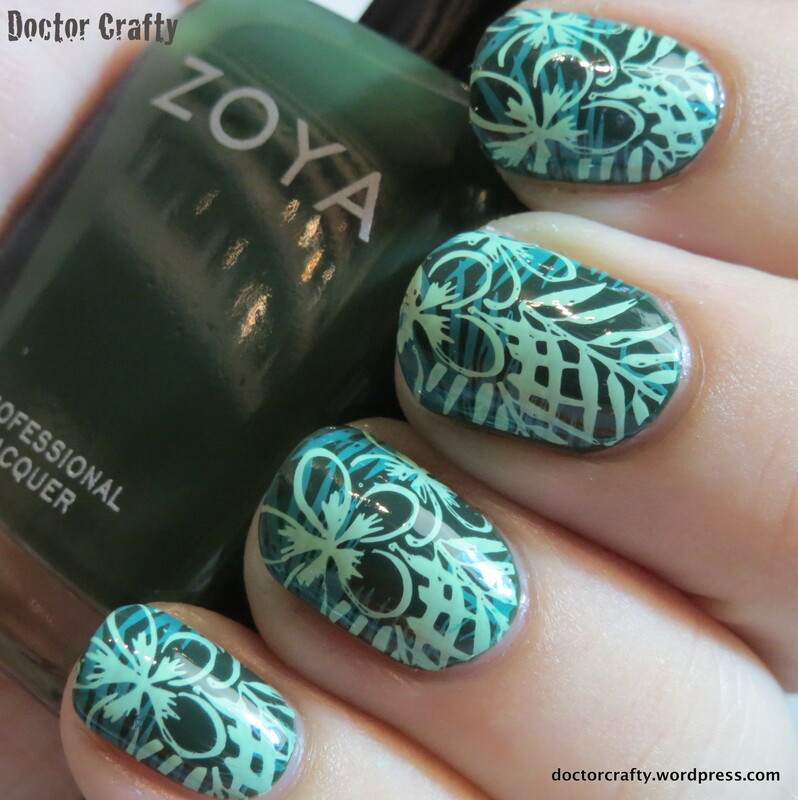 It’s gorgeous on its own AND it works as a perfect stamping polish! this is lovely! So much depth! Oh my, I LOVE THESE! The colors are great and the design is just perfect!! Thank you so much! I love green, and these are 3 of my favorite shades of green! Your double stamping looks great, I haven’t done a successful double stamp yet! Thanks! 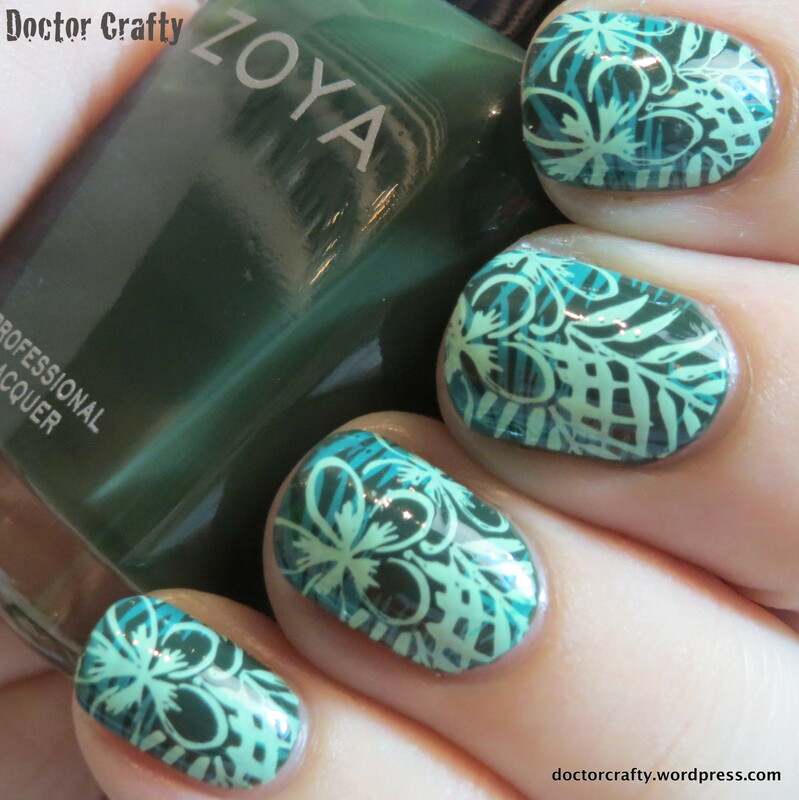 It definitely takes a specific stamp choice and color choice to get a good result on the double stamping! Really beautiful. I love the layering you did. That’s a great double stamp! I love the patterns and the colours! Thank you so much! It definitely takes practice to get the hang of it, but I really love stamping!